Let’s finish up our car month with some driving music. Certainly The Pretenders capture that long, long occupation with “2000 Miles.” It’s a rambling relic of classic alternative rock. And pretty. And barely Xmas. I’ve already noted “Arkansas Angel” by Dan Schafer. Go get that holiday girl, bluegrass Dan! But I haven’t given credit to Vic Sorrell from the same Christmas Across America project. His “Driving Home at Christmastime” ostensibly is about Tennessee (every song in the collection is about a different state), but it’s more about that frame of mind of being caught on the road in the cold. Pretty but a bit whiney. Not enough road rage holiday tunes. Shopping for Christmas means parking for Christmas. Sad news show filler “Parking Around the Shopping Mall” features Barry Mitchell and an accordion. You can probably imagine funnier. Nearing the bottom of the barrel is more overproduced Bob Rivers. “Parking Spaces” is another sneaky squeeze of humor from the old grandmaster. At least it takes music from ‘Wenceslas,’ which few enough caroldies do. Better than last-minute rush stress, parking lots are suited for loitering. Cut the deck on Mark Tolstrup and Dale Haskell singing the aitch out of the blues in “Christmas Eve in a Liquor Store Parking Lot.” Money makes dreams come true…. What else is wrong with driving during the holidays… Oh yes, everyone else. Rev. Vince Burke does karaoke (to ‘Winter Wonderland’) for his congregation with “Stuck in a Manila Traffic Jam.” He brings down the house. Or uplifts it. Not sure. 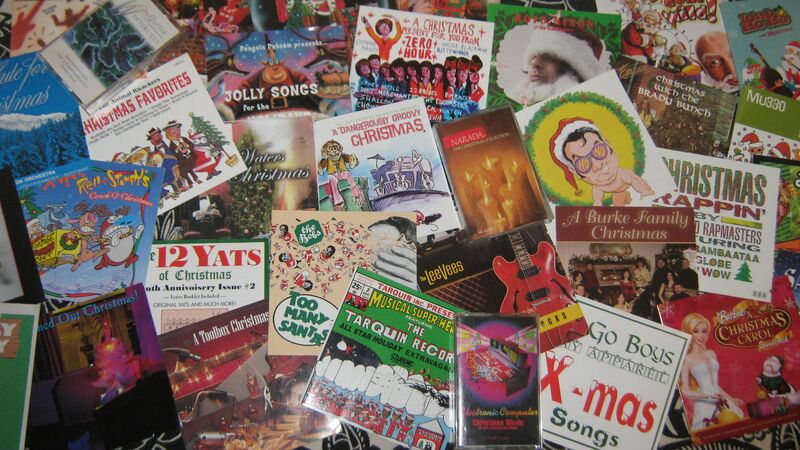 Even more fun, the Hollytones yodel comically with “Gridlock Christmas.” Roll down the windows and crank it up! MANDR01D gives us the techno electronica we’ve been missing. “All I Want for Christmas is a Burnt Out Car” ladles punk into a Tangerine Dream backbeat and a few electric dance riffs. Fun Terminator backdrop here. Now that we’ve been lectured on safe driving methods for the end of Dec. let’s deal with the worst case scenario. Except some people think of auto wipeouts as having a silver lining. Take Larry the Cable Guy. Please. His “I Wish My Mother-in-Law’d Get Hit by a Car” is fine parody, but as it appears at the end of his Very Larry Christmas album in which he includes his obnoxious sign off. That’s a tragic accident. You can look up all the vehicular parodies on ‘Grandma Got run Over’ yourself. They involve rednecks, a John Deere, a beer truck, a fork lift, and a Grand Marquis. Merry luck to you. That’s enough of the horror of road wrecks, except The Rosenkranz seem to relish the idea of a nice “Car Crash for Xmas.” (This is presented as a cheerier alternative to the drudgery of life, family, and friends.) Their dreamy alt rock is very persuasive and i almost might want me one too. Okay, here’s something funny. Take ‘Feliz Navidad,’ a fine multicultural carol, and mix it up with drunken mayhem and you get… pretty much the same parody from different laughy lyricists. Cheech and Chong have a take called “Police Got My Car” which seems funny when Tommy tries to reason with the fuming Sr. Marin. But, without musical backing, this otherwise pachuco parody goes up in drink. Lizzy8784 tries not to laugh with her man singing racist fun in their own “Police Took My Car.” Well, now we have bongos. From the other border, Snook ‘sings’ “Police Got My Car.” More funny accents, more complaints about not having wheels. Nice screechy strings. The best Jose Feliciano comes from Bob Rivers. “Police Stop My Car” has made me laugh for many years now. Inappropriate, i suppose, but at least the cops aren’t called dicks this time. Much as i can picture elves getting tanked, or Frosty getting toasted, the number of drunk driving songs with Santa’s adjuncts are few. After leaving the truck stop, pat yourself down to make sure you didn’t leave anything–say like your sobriety. Drunk Christmas will be covered later. Drunk driving for Christmas is an even more serious subject. So let’s sing about it. Garage rocking band Boozer settles comfortably into “All I Got for Christmas was a DUI.” Bourgeois blubbering regret. What they got against Elvis? Spoken word poet Shawn Mafia gets mad at Santa while busting a crime in his “All I Got for Xmas was a DUI.” Mad verbal skills, but what’s he sound like sloshed? J.D. Rogers tells quite a “DUI for Christmas” story to the tune of Keen’s ‘Merry Christmas from the Family.’ With the continually puking and cop cam roadside testing i guess this is supposed to be some kind of joke. Kinda liked the song. I am contractually obligated to mention Bob Rivers whenever i can. “Carol of the Bartenders” is a clever bit of PSA. Perhaps too flip.